Webserver configuration with OpenSSL for secure data transfer (https) strongly advised. 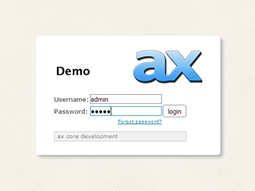 Download the latest version of ax-framework from our website. Unzip the archive to your desired webserver folder. Note: ax-framework is capable of running in relative path situations and can therewith be used as backend only. We recommend either /ax or your webserver root folder. edit config.inc.php to your desired need. This concludes the installation part and your first look around in ax. At any occasion we are happy to assist you via our support system. We would now advise you to get familiar with some basic concepts before delving into the code of our demo applications.